Sergiu Ciobanu (Clonliffe Harriers) surged to his fourth national title in Dublin today in 2:17:40 while Laura Graham (Mourne Runners) took a big step up in class to win the women’s national title in a massive personal best of 2:41:54. 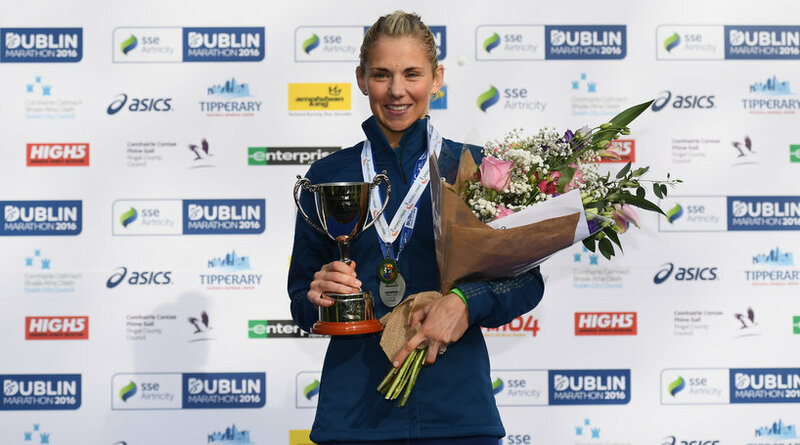 Record numbers took to the streets for the SSE Airtricity Dublin marathon in perfect conditions for runners and the times and competition didn’t disappoint. Dereje Debele Tulu (Ethiopia) won outright with 2:12:18 and Namibia’s Helalia Johannes was the first woman in 2:32:32 – just one second ahead of Ehite Bizuayehu Gebireyes. In the bid for national glory, Sergiu Ciobanu and Sean Hehir (Rathfarnham) were locked together until the feeding station at the 20km point. “I kept the same pace,” said Ciobanu on gapping Hehir at 20km. “Gradually I opened the lead but Sean (Hehir) finished hard and fast. He wasn’t far behind me. Hehir settled for silver in 2:18:46 with Mark Kirwan (Raheny Shamrock) winning the battle for bronze with Gary O’Hanlon (Clonliffe Harriers) in 2:22:17. Ciobanu’s time of 2:17:40 was just outside the World Championships qualifying time of 2:17:00 but he’s looking forward to the future and pulling on the green vest once more. Laura Graham pulled out all the stops and took full advantage of the perfect running conditions to significantly rewrite her previous best time of 2:48:03 set in London earlier this year. With four children aged 6, 5, 4 and 3, Graham has to do a lot of her training on the treadmill to keep an eye on the youngest along with the occasional ‘bumpy ride’ with the buggy in toe out on the roads. She is coached by Ryan Maxwell who provides in depth coverage of Northern Ireland athletics on @nirunning and his website as a voluntary service. Caitriona Jennings (Letterkenny) took silver with 2:44:59 and last year’s winner Pauline Curley (Tullamore Harriers) had to settle for the bronze with 2:48:83 – faster than her winning time last year. Le Cheile’s Patrick Monahan won the wheelchair race once more in a new best time of 1:39:18.